Flows on the upper Dolores River above McPhee Reservoir were at 1,000 cubic feet per second (cfs) as of Sunday. Below McPhee Dam, a 60-day whitewater release is planned, with initial ramp-up of 400 cfs per day starting on April 11. By April 16, rafting flows will reach 2,000 cfs, and stay there for 30 days. 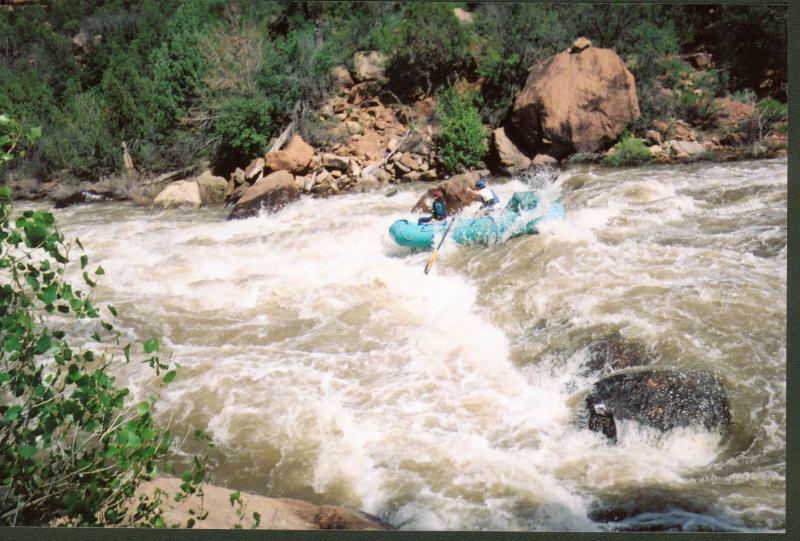 The main Lower Dolores River boating run stretches for 100 miles through winding, red-rock canyons interspersed with rapids ranging from Class I to Class IV, including the famed Snaggletooth Rapid at mile marker 27. 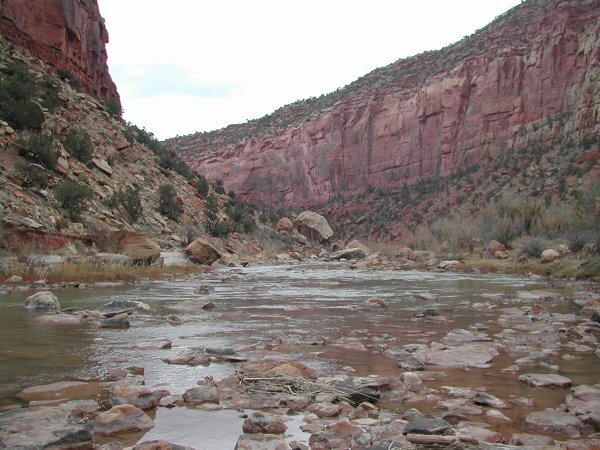 The Lower Dolores River is considered one of the premiere multiday boat trips in the nation when it has enough water to run. No permit is required. Biologists with Colorado Parks and Wildlife will do fish counts on native and non-native populations, and conduct habitat improvement measures. “We have a lot of opportunity this year for fish sampling and monitoring,” said Jim White, a fish biologist for Parks and Wildlife, during a presentation Thursday at the Dolores Water Conservancy office. His team will be studying population health of three native fish in the Lower Dolores: the roundtail chub, flannelmouth sucker and bluehead sucker. One of their objectives is to measure the non-native small-mouth bass population, then work toward reducing them. Small-mouth bass are a threat to native fish, preying on their young and competing for food sources. “We want to find out how widespread small-mouth bass are, especially if they are established in Slick Rock Canyon,” White said. Parks and Wildlife manages a 32,000 acre feet “fish pool” in McPhee Reservoir for minimum base flows releases below the dam. During a whitewater release, the fish pool is not debited, White said, giving fish biologists more flexibility in how to use it. They will tap into 2,600 acre feet of the reserve for the bass-removal flush. The Nature Conservancy is sending a team of researchers to the Lower Dolores for 10-15 days, said Colorado chapter representative Celine Hawkins. The Nature Conservancy will be using drones to take aerial photos of the Lower Dolores before and after peak flows to track changes and compare them to past years. They are focusing monitoring efforts at Disappointment Creek, Dove Creek Pumps, Big Gypsum Valley and Bedrock. Colorado Parks and Wildlife shared results of a 2016 fish study on the Dolores River. A cold-water fishery sampling below the dam showed two-thirds brown trout and 16 percent rainbow trout. Algae due to infrequent flushing flows is abundant in the 12 miles of stream immediately below the dam. There is a concern it could have a negative impact on fish. In June, the 20-mile Ponderosa Gorge section (Bradfield Bridge to Dove Creek pump house) was surveyed. Of the 180 fish caught, 73 percent were brown trout, and roundtail chub was the second-most abundant. No small-mouth bass were found in the gorge. Sampling at the Dove Creek pump station showed roundtail chub were holding steady, in part because they are an adapted pool species. Bluehead and flannelmouth suckers were in relative low abundance, and depend more on a ripple environment. In 1992, fish sampling showed much higher numbers of native fish species, the study noted. “The impact of flushing flows in (2016) was evident, and backwaters looked cleaner,” according to study results. The past two years, Parks and Wildlife has been stocking bluehead suckers in the Lower Dolores. 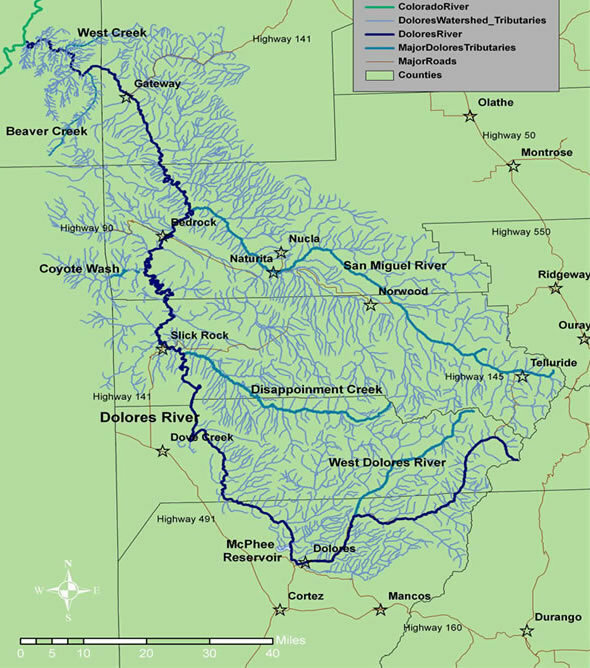 The fish historically relied on Plateau, Beaver and House creeks for spawning areas, but the dam and reservoir altered the river so suckers cannot reach those ephemeral streams. In 2016, 4316 bluehead fingerlings were released downstream of the Dove Creek Pump house. In 2013, a pit-tag array recorded one flannelmouth traveled 264 miles.